Heat stroke is a life threatening condition for Boxers that can happen during any time of the year. Boxers are especially prone to this deadly condition because of their short noses. Since Boxers have short noses and wide heads, they can’t pant as well as longer-nosed dogs, meaning they can’t cool off as quickly. Stress from the heat has a greater impact on Boxers than on other breeds. Heat stroke requires immediate attention to avoid serious damage or death. Unlike humans, dogs do not sweat through their skin. Rather, they sweat only through the pads of their feet. Boxers especially rely on panting to help them cool down. You might not think it’s hot out, but for your Boxer, even a cooler day can result in heat stroke if he has had too much physical activity and overexertion. One of the biggest causes of heat stroke in dogs is leaving them in a car. Do not assume that you can leave your Boxer in the car for a few minutes on a cool day. Boxers can quickly over heat when left in a car, since cars heat up very quickly. It doesn’t matter if you crack the windows, a Boxer left in a car can become extremely ill. Fatal heat stroke can happen within only minutes of leaving your Boxer in the car in direct sunlight. Deep, shallow, or absent breathing. Heavy salivation, followed by dry gums. Paleness or graying of the gums. Due to their playful natures and desire to please their owners, some Boxers (puppies especially) will keep playing and exerting themselves until they collapse. Make sure that you give your Boxer breaks and never push him beyond his limit. Always provide him with fresh, cool water to drink. Give him more water when he’s been outside in the heat or vigorously playing or exercising. Never wait if your Boxer is showing signs of heat stroke. Cool him down right away and immediately get him to the vet. This can mean the difference between life and death. Massaging his legs will also help to keep his blood circulating and prevent him from going into shock. Although heat stroke is an extremely scary and dangerous condition, it’s very easy to prevent. 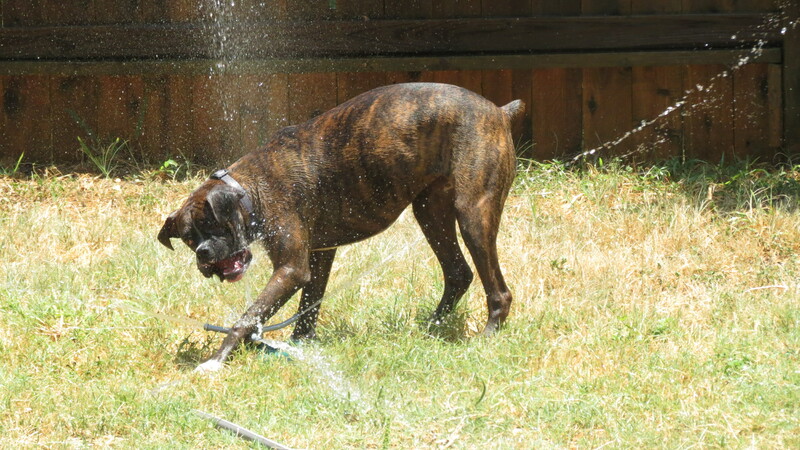 Always remember that your Boxer is not a machine and that like you, he needs a break and cool, refreshing water to keep him healthy especially during the warmer months.